WTF Just Happened On The Flash? Spoilers for tonight’s episode of The Flash are below. Last week, Harrison Wells caused a lot of hands to smack foreheads when he announced the best possible plan to give Barry back his powers would involve recreating the particle accelerator explosion that gave him his power in the first place. It was clearly a dumb move, but desperation backed Team Flash into a corner, and they had to try anything to disrupt Zoom’s takeover of Central City. And though Wells seemingly replicated the earlier accident, it didn’t result in either a repowered Barry or a comatose Barry. No, we don’t know what it really did to him, because Barry straight up disappeared. Barry didn’t simply vanish from the contraption in which he was strapped, but he turned into a moving explosion of flames and sparks and other forms of light. The fire was orange, so that was a possible sign that Barry had indeed recovered some or all of his speediness, but having it all fade into nothingness wasn’t a sign of anything good. Especially when part of his costume was found all burned up. Of course, we don’t have to actually worry about Barry being dead or anything else that will permanently take him out of the show. This isn’t Game of Thrones. 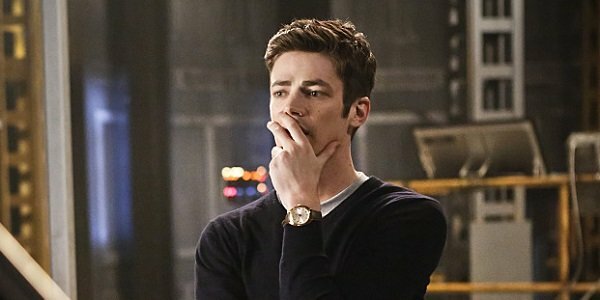 The trailer for next week’s episode shows that Barry is lost somewhere in the universe and/or in time, but apparently not in the same way that Legends of Tomorrow’s characters get stuck. These scenes use a different color filter, and the mood is rather strange, what with Not-Joe telling Barry that he’s never getting out of there. Pretty creepy stuff from Jesse L. Martin. So…what the hell happened? Did the explosion knock all of Barry’s cells out of line, transporting him into some other dimension outside of Earth-1 and Earth-2? Are there time wraiths there? Did he become one with the speed force in a nod to the comics? Did anything happen to Wally and Jesse when Barry’s flame-wave went past them? And obviously the most important question: how he can possibly return from his current predicament? “Rupture,” despite being named after the Earth-2 villain that posed a temporary threat, is far more about the A-list villain, who not only killed a bunch of Central City cops but also alerted everyone that The Flash wasn’t around to save them anymore. Besides, Zoom killed Rupture anyway, leading me to wonder why these villains agree to take these Earth-1 missions when no one gets out alive. Though the evil speedster is needlessly taking way too long to actually bring Central City down, the steps he has taken are pretty frightening in their nature. Big things are still yet to come. With just three episodes left in Season 2, The Flash airs Tuesday nights on The CW. Head to the next page to see the promo for next week’s Kevin Smith-directed episode, and find out everything that’s premiering in the coming weeks with our summer TV schedule.